In the summer of 2016, Manchester City Football Club were presented with a gift; a man who’d done it all: Pep Guardiola. The feeling around the club was that of total optimism. Surely, after three years of ups and downs with Manuel Pellegrini, Guardiola was the man to take the club to the next level. After a year in the job, the jury was still out; City had played some fantastic football, but results hadn’t always followed. City hadn’t quite dished up a spectacular main course, but instead had offered a tasty starter, not quite enough to satisfy your needs, but something to intrigue everyone as to what lay ahead. So, what came with Guardiola? Well, by far his most controversial move in his early days at City was the declaration that Joe Hart, City’s number one for the previous five seasons, was not going to be his man between the sticks. This decision was met with plenty of uproar. For many a City fan, Hart was the only man to keep goal for City. Whether or not he was seen to be the world’s best coach, a huge portion of the fanbase felt that Pep was stepping on a fan favourite – were they right? Who knows? What was clear was that Guardiola didn’t feel that Hart possessed a skill set that was appropriate for his style of football. Typically, Guardiola goalkeepers were quick off their line, swept up any danger, and perhaps most importantly – could play with the ball. Joe Hart had never, in all of his time at City, proven himself to be capable with the ball at his feet. I don’t think many City fans would argue otherwise, but what was argued was whether or not it was paramount that a goalkeeper be able to play out from the back. To me, that argument was simply preposterous. For years, City had flirted with the possibility of signing arguably the best manager of this generation, and now that he’d arrived, people were questioning his tactical mindset. Of course, Pep didn’t listen – he didn’t come to City to change his own philosophy. He came to change City’s. So he went out into the transfer market, and brought back a player who was renowned for his ability to pass the ball from his six yard box: Claudio Bravo. It was never going to be easy for Bravo. You could even say that he was doomed from minute one. He was following in the footsteps of Hart, who was many a fan’s favourite player; a man who epitomised passion and a genuine love for the club. Poor Bravo – if the Chilean was to misplace a pass, he’d know about it. If he conceded a soft-looking goal, he’d know about it. I’d go as far to say that there were Blues who were urging him to fail, so that they could hammer Guardiola for dismissing an untouchable City hero in Hart. In many ways, it wasn’t Bravo’s sword to fall on, it was Pep’s. Our new goalkeeper had come to Manchester in search of a new challenge, but the pressure on him from minute one was unbelievable. So, in came Bravo, whose first City game took place at Old Trafford. There aren’t many harder places to go in England for a first game, whichever side you play for. Now try to factor in that it’s a Manchester derby, with both sides on 100% records. United made it hard for City’s newest acquisition, pumping long balls up to Zlatan Ibrahimovic, who dwarfed Bravo. Despite taking a 2-0 lead, City came unstuck after Bravo failed to deal with one of those long punts forward. In the second half, the Chilean was very fortunate not to concede a penalty. However, despite a shaky 45 minutes, City held on and won the game 2-1. Unfortunately, that was about as good as it got for Bravo – a somewhat unconvincing performance in a Manchester derby, which at the very least led to three points. What followed were a string of worrying performances, perhaps most notably in his old stomping ground: the Camp Nou. After trying to sweep up the danger, Bravo handballed outside of his box and was given a straight red card. City lost the game 4-0, despite showing signs of life before Bravo’s dismissal. The pressure continued to grow on Bravo. With every goal conceded, there were murmurs of Joe Hart. It can’t have done any good for our new number one, but that’s not to say that he did himself any favours. Some pretty embarrassing statistics followed throughout the season, Bravo’s save percentage was the lowest in the Premier League. It was a bit of a nightmare. Did he prove himself to be at all capable with the ball at his feet? Yes. Was it enough to distract people from his inability to save fairly basic attempts on goal? No. Nonetheless, a case can be made that Bravo was never really given a chance to succeed by the fans. The season ended with Bravo’s stock having plummeted about as low as it gets. It was clear to anyone that’d read a newspaper or seen an online article that City were going to be in the market for a new first-choice goalkeeper in the off-season. Ederson arrived in June, and Bravo’s time as City’s number one was over. Ederson’s arrival proved one thing for certain – you can sign a goalkeeper who can both save shots and play football. But for Claudio Bravo, Ederson’s arrival did something vitally important – it allowed him to take a step backwards and start to try and rebuild his reputation. As is typically the case, your second-choice goalkeeper plays games in the League Cup; this was no different for City in the 2015/16 campaign. After progressing through rounds 3-6, City eventually faced Liverpool in a mouth-watering cup final that promised plenty of drama. One of the biggest talking points coming out of the City camp before the game was whether or not Pellegrini would risk playing his unconvincing second-choice goalkeeper Caballero, as he had in every round prior, or whether he’d opt for the more reliable Joe Hart. Pellegrini stayed loyal to his backup, and Caballero repaid that loyalty. After an impressive 120 minutes in which Willy saved City on more than a couple of occasions, a penalty shootout was left to decide the game. Heading into the shootout, you could’ve forgiven any of the City fans for feeling somewhat pessimistic. How wrong they were. After missing the first our first penalty of the shootout, and seeing Liverpool score their first, City were beginning to look down and out. Up stepped Lucas Leiva for Liverpool, with a chance to send them into a 2-0 shootout lead. Caballero saved magnificently, and allowed City a chance to restore parity. Jesus Navas did so; 1-1. Phillipe Coutinho was next for Liverpool, and again Caballero saved. There was pandemonium in the stands. City needed only to score their remaining penalties, and the cup was theirs. Sergio Aguero made no mistake; 2-1 to City with two remaining for each side. Adam Lallana needed to score to give Liverpool some hope; Caballero had other ideas. Willy get down to his right and made a magnificent save to complete a trio of vitally important moments of heroics. Yaya Toure wrapped the shootout up, City had won the cup. Perhaps the most telling moment of the day came immediately after though. Rather than run to the Ivorian, City’s players all made their way to the true hero of the day: Willy. The game gave Caballero a new lease of life. It was enough for any of the football romantics to feel supremely satisfied. A man chastised for a couple of seasons had fought back and produced a performance that would be remembered forever in City’s rich history. He left in the summer of 2017 a hero, that one game was enough to cement his place in City folklore forever. On Tuesday, Claudio Bravo, a man chastised by City fans for over a year, was able to produce his own penalty shootout heroics; but it was more than just two penalty saves that gave everyone a sense of a new beginning for Bravo. Last season, you’d have been lucky to see Bravo save a shot on target. It really did, at times, feel as if anything that was hit toward the goal would fly in past him. However, on Tuesday, we saw Wolves have a host of huge opportunities. Bravo made light work of every one of them, all before his starring role in the shootout. It felt like a repeat of Willy’s heroics. Bravo’s year of hell was finally over. He’d finally earned the trust of some of the fans in the stands. He’d finally had his moment. So, what changed? In all honesty, I think that the arrival of Ederson was magnificent for Bravo, as much as it might’ve seemed like a death sentence. Of course, it meant that he was no longer City’s first-choice, but it gave Bravo the opportunity to quietly regain his confidence whilst Ederson was in the firing line. The pressure on Bravo has been significantly reduced, despite it being down to his lesser importance in the squad. You get the impression that Tuesday’s game was a turning point for him, and we’re bound to see more of Claudio – especially after advancing to the next round of the League Cup. Sometimes all it takes is one game, or one moment to regain the fans’ confidence. 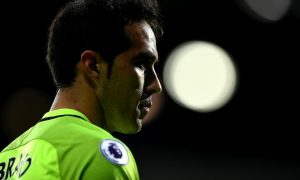 Claudio Bravo had his game on Tuesday night, and whilst there will still be doubters – it felt as if the goalkeeper that we were promised over a year ago, has finally arrived at the Etihad.